Thank you! I was inspired a lot by a good number of classic platformer games, and tried to make the art feel retro :) I hope you enjoy what's in store! Thank you so much! :D It's been a lot of work, and I've put a lot of my heart into it, and it's honestly so nice hearing such kind words about it! I hope you enjoy this Christmas season, God bless you! Really glad you enjoyed the update ^0^ We love giving our players new and exciting things to discover and play! It's a very unexplored genre :) I really enjoy using genres that are more obscure because it give you more room for creativity! We'll look into the issue you had with the DDR stage, thanks for letting us know about it! And we love you! ;) Glad you enjoyed it! Thanks for the feedback! Even if it's criticism, it helps us to know what the users want more, and what they have problems with! Also, we're currently thinking of ideas to make the end of the boss stage more satisfying / more fluid (no pun intended). Please! Tell us your criticisms! Tell us what parts you enjoyed most! We crave it! I really enjoyed the art and music! I'm jamming out to the music right now! That was lovely :) However, I think something that frustrated me very much was how large the enemy hitboxes are... In general, enemy hitboxes should ALWAYS be smaller than their sprite is, so as to help the player and give a bit of grace. Other than that, the art made me laugh at each planet's expression :3 The distance between health packs seemed a bit too long sometimes, but I think part of that plays into how large the enemy hitboxes are, and how much I hade to swerve to avoid them. I feel like, although it's already submitted, I'd like to see where you were going with this idea! :) Work on it little by little, and try and plan out what you're going to do. Look at your plan, and be VERY critical of whether or not you can actually accomplish it. However, it does pose a slightly big difficulty curve, as I barely got started before numerous enemies appeared. It took me a couple tries before I could get somewhere, but once I did, I felt like it was cool how there were secret things like ores in the corners of the world. If I could make some suggestion: Enemy tribes, which start off in the same place as you. They could be much further off the map. There could be a fog-of-war coupled with this that would require explorers maybe to be able to see more. If you conquer an enemy tribe, it becomes your own. Thanks! We put a lot of heart into making the game come together :D We'll be updating it here and in the other page, posted by Zen00. BTW: What minigame was it that you had just finished when you encountered this problem? It most likely has to do with the minigame itself, so if you can remember, we can check it out! Thank you! P.S. - The ducks are scarce on money, and the player is scarce on time. Thanks! We hope to be able to update the game on the non-jam game page (https://zen00.itch.io/duck-jam) :D Keep your eyes out for changes there! 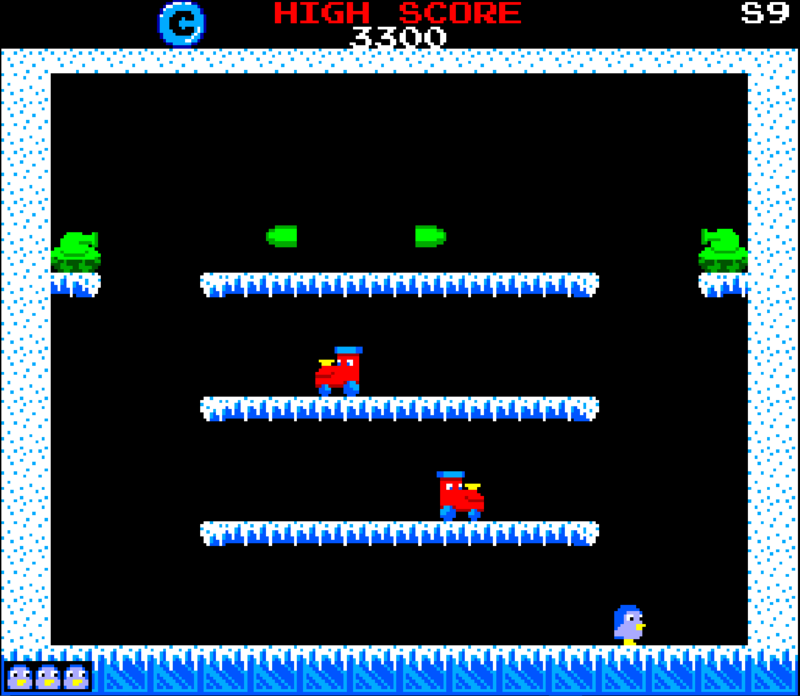 Percy the Penguin is a platformer designed to mimic old arcade games, such as "Mario Bros." and "Bubble Bobble". Throw snowballs at rogue Christmas toys to stun them, and touch them to wrap them in a present. Once every enemy is wrapped up, continue on to the next level! For 1-2 players. PixelPaint community · Created a new topic Bugs, Bugs, whose found the Bugs!